I'm a sun worshipper. Yes, it's true. When the sun is out, there is no getting rid of the smile on my face or denying the electric waves of energy that pulse through my body. I want to run, I want to dance, I want to giggle until I collapse on a picnic blanket in a meadow full of wildflowers. The sun feeds me. But with the summer sun comes real concerns about skin safety. I was interested that the latest New York Times post about sunscreen is saying that we should avoid being out in the sun at mid-day, and should still be wearing coverings like hats and sleeves as sunscreen doesn't do enough to protect the skin during those harsh sunlight hours. The article also pointed out the dangerous hormone disrupting chemical oxybenzone - found in over 65% of sunscreens. The Environmental Working Group puts out a great sunscreen guide every year that highlights the best brands to buy. The New York Times post also highlights Zinc Oxide as good ingredient to look for in sunscreen. Zinc Oxide must be at least 20% of the formula in order to be at least SPF30. 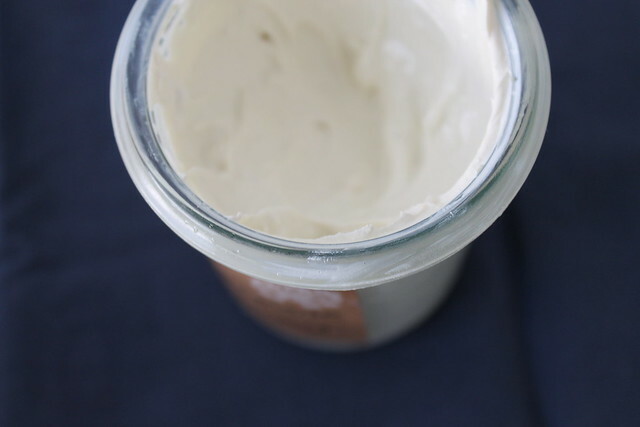 So, knowing this, I realized I could make my own homemade sunscreen using Zinc Oxide powder, combining it with skin loving shea butter, coconut oil, and beeswax. It's some good stuff. So let me show you how! Combine the shea butter and coconut oil in a double boiler (I just put a glass bowl over a saucepan with boiling water) and melt down before adding the beeswax. Remove from heat and pour into another bowl. 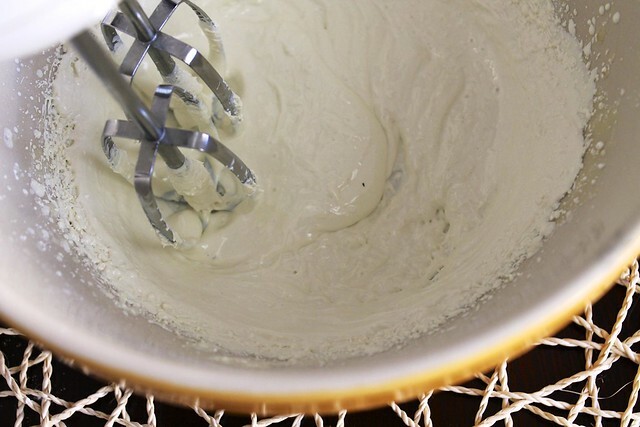 Blend with a hand blender on medium and slowly add in the 2 tbsp zinc powder. Blend until well combined and there are no clumps. Let cool to room temperature and you've got sunscreen, baby! Store in a jar in a cool, dark cupboard for up to 1 month. 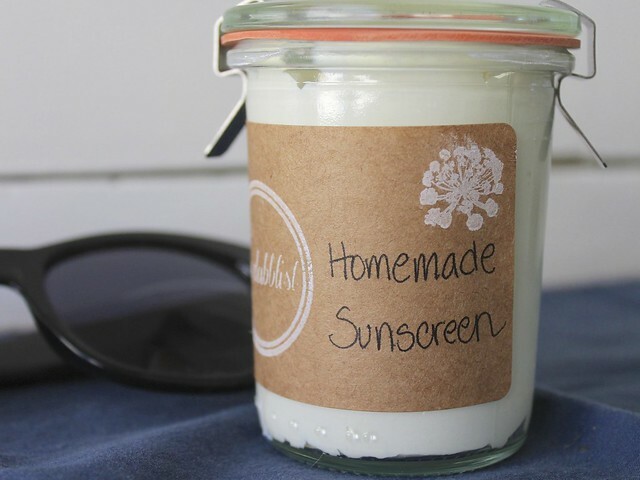 Now, this homemade sunscreen is a bit different from the store bought kind. It needs to be rubbed in with some vigor to avoid white streaks. But I can tell you that it definitely works, as I put some on this past weekend and didn't burn after a day in the sunshine. AWESOME. I see that the link you posted takes you to a pound of the zinc. Any recommendations about what to do with the rest of the bag? I know, it’s such a huge bag but I tend to buy my ingredients in bulk. I plan on making more sunscreen since this batch will only last a few more sun sessions. 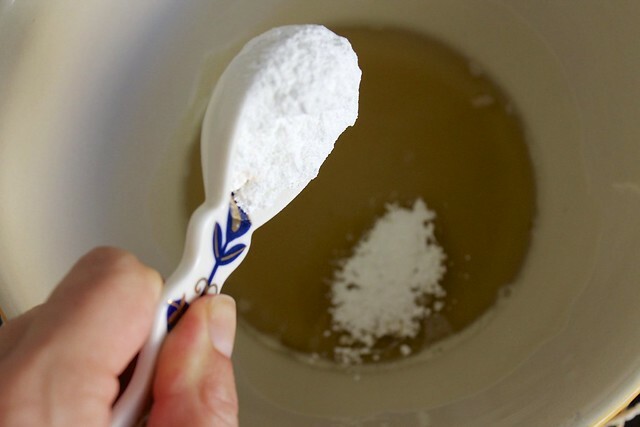 Zinc Oxide powder has many uses. I’ll be sure to post more tutorials that involve it so it’s worth the purchase. Wow! I have been searching for a good natural sunscreen! This is great. I love the simple ingredients! Will definitely have to try this out for summer! Great recipe! I have a bunch of zinc oxide here, so I can make a huge batch and gift some of my friends and family too! I am definitely going to try this!!!! Thanks so much for sharing. Awesome, ladies! Let me know how it goes. I’m betting you could add some mild essential oils to make it smell even more lovely. What a great idea Becca! LOVE this! Thanks for sharing! I have found that most suncreens on the market have many toxic ingredients and the healthier brands cost quite a bundle – I will definitely be using this recipe. Just so ya know, Coconut oil was a stellar ingredient choice as it is also a natural sun protectant with an spf of 4-10 – it’s high anti-oxidant properties help prevent burning and the oxidative damage which promotes skin cancer! If you are looking for small quantities of safe zinc, look no further than the baby section at your local drugstore. There are non-scented diaper rash creams that have nothing more than zinc oxide and some beeswax type ingredients. Add some lavender essential oil! It is great for your skin when mixed with a carrier oil (which there’s plenty of here!) AND (drum roll please) bugs don’t like it!! You’ve just turned your sunscreen into bug repellant! Does Zinc Oxide have an expiration? Just wondering since it may not be used all up right away. The package says “good until May 2015” so I’m assuming it’s 2 years. I have been using coco nut oil and aloe vera products for years. There is nothing to touch either product. Check out my pics on Dodie Hamilton Books. I am 71. Thank you for this. It’s a great idea. How long do you think the sunscreen is good for? Hey I want to make this recipe but I’m confused about the double boiler. If u don’t have one u said u cover your pan with a glass bowl an water til it boils… Is water used in this recipe? Thanks for this! I’m assuming this makes about 5 ounces based on ingredient measurements. How long do you expect this amount to last (how many applications, I mean)? I’m allergic to shea butter. I know, strange! Would coco butter be a good substitute for it? Or is there another product you would recommend? Make sure that the zinc oxide in non-nano. Also coconut oil has 4-7% sunscreen protection in itself. Cocoa butter can be substituted for Shea butter. You can add Iron oxides or cacao powder for color. A bit of beeswax will make it more water resistant. Jojoba oil also helps emulsify Non-Nano zinc to make it clear. Lavender oil is a good choice. Make sure that the zinc oxide in non-nano. Also coconut oil has 4-7% sunscreen protection in itself. Cocoa butter can be substituted for Shea butter. You can add Iron oxides or cacao powder for color. A bit of beeswax will make it more water resistant. Jojoba oil also helps emulsify. Non-Nano zinc to make it clear. Lavender oil is a good choice. Non-Nano zinc can be made clear because the jojoba oil helps emulsify it. Sounds great 🙂 is this only physical filter , that protects from UV-B rays, or will it protect from UV-A rays as well?? I have lupus and have to wear sunscreen daily aside get keratin and have to have them remove. This is awesome! Should save me a lot and is all natural. Sharing with my fellow lupies! Thank you! I’m very interested in making this as well. My question is, however – does it protect all skin types the same? I’m a red head, and even 30 minutes in the sun – I’m a lobster. I’ve avoided the sun for years because the degree of the burns I sustained in the past have made me gun shy to sunlight. I’ve used the 70 SPF stuff, even up to 100 SPF. The 100 works the best but I’m not thrilled about the chemical compounds. Great idea! It likewise can add raspberry (Rubus idæus) oil which has a high enough protection … With this preparation, we have a sunscreen of about SPF? Hi! I really like this recipe and have been using it for about a week. Has anyone had any problems with the zinc clumping in the jar? I don’t have any clumps when I pour it in, but after it sits, it begins to clump up. Did I not mix the batch enough? Thanks! Hi, my question is about the comment above by Rosa Martinez-Button about the zinc emulsifying in the jojoba oil and then it’s not as white. Is there a way to contact her or do you happen to know? What is the procedure to do this? Hi Jenn, Unfortunately unless Rosa sees this post I have no way of getting you two in touch. Sorry I can’t be of more help here. I love this recipe and am excited to make it, but it seems based on the ingredients and the zinc having a 2 year expiration limit, that it would last much longer than 1 mo. Am I wrong? I’d love to be able to make one batch for the whole summer. Also, any idea about the SPF? My hubby is Irish and burns easily. Thanks! SPF is hard to say accurately, but it would be at least a 30. I would do a trial with your hubs to see how it goes and adjust from there. I’m so glad to have found this! We recently made some DIY lip balm + SPF (http://www.afetefullife.com/diy-lip-balm-for-summer/). I bought in bulk too and have been looking for other projects to use the ingredients. Thanks for sharing! A word of caution – not all Zinc Oxides will give good SPF, and SPF can change dramatically with different formulations. I work with professional sunscreen formulators who specialise in natural ZnO sunscreens, and test different formulations daily, and it is a very tricky thing to get right. One big thing is the quality of the Zinc Oxide. Most of the Zinc Oxide you will get is pigment grade. Large agglomerates, but it will still feel fine. It just won’t protect very well, or to get protected you will be white as a sheet. The finer the grade, the more reliable the SPF and the more transparent the product will be on the skin. Unless you have a certificate of analysis from the supplier you have no way of knowing. SPF is also affected by the other ingredients. The oils, waxes and dispersants all have an effect. It is not predictable, which is why the professionals don’t make SPF claims without testing. Anyone who claims this % of ZnO will definitely give this SPF is guessing unless it has been tested. Tested is not the same as putting it on the kids and seeing if they get burnt. The other thing is don’t keep the formulation very long. Even though ZnO has some good properties in this area, stable formulations are difficult to make. You could end up with a nasty breed of bug getting wiped all over your skin. While the Zinc may have a long shelf life, and the oil may have a long life too the combination may not be good. We have one ZnO that works well with one oil, but a slightly different ZnO won’t work with the same oil. This recipe might give you some protection – but might not. And it could be different every time. I’m not saying don’t try it yourself, but be careful. OK if you like taking a chance, but if your (and your families) skin protection is important, or you are spending days at the beach, pay a few dollars and get a sunscreen from a reputable lab. How does this do when swimming? I’m curious how water resistant it is. If I’m using 1/2 cup Shea butter, how much oxide zinc do I usr? what can i use instead of bees wax as I am vegan. Thank you. Why do you use bees wax and coconut oil?